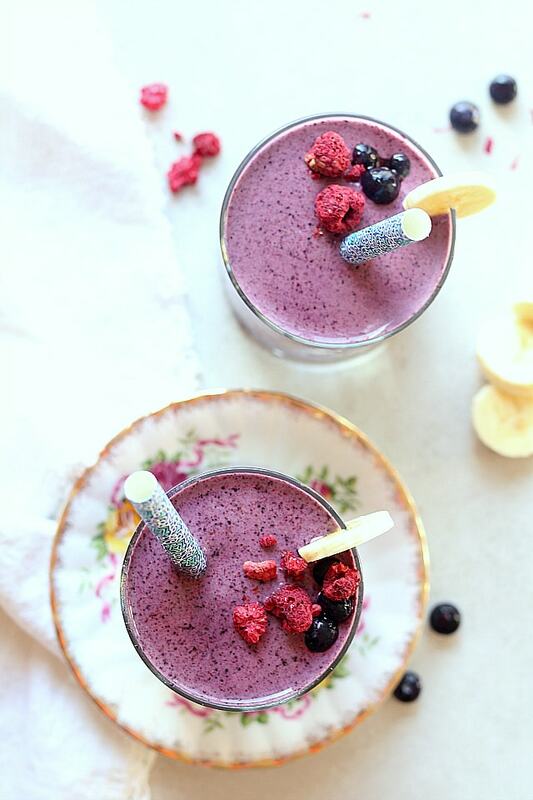 Quick and simple healthy blueberry banana smoothie recipe! 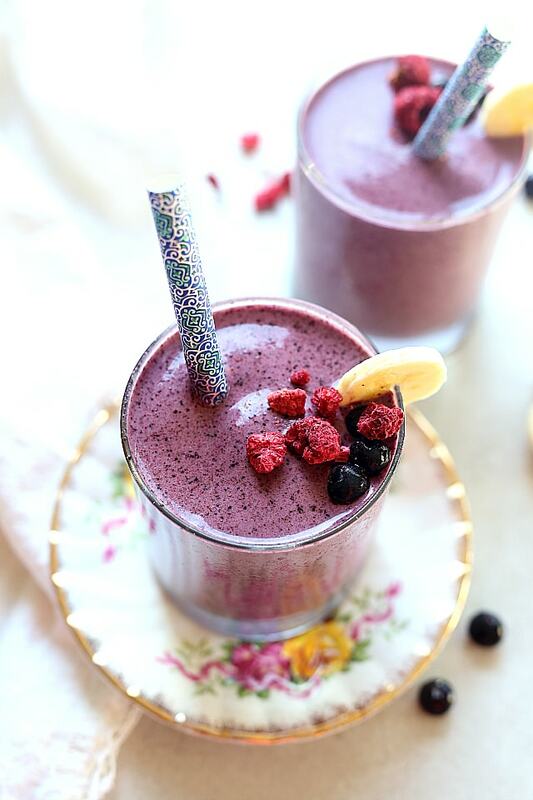 To make this gorgeous indigo colored blueberry smoothie blend dairy-free milk with frozen blueberries, banana and two extra secret ingredients that will give you the perfect balance of energy that will last for hours! Blueberries should just be labeled the ultimate rich antioxidant super power food of all time! Because everything in that phrase is exactly what this super fruit is all about! Blueberries are rich in antioxidants, fiber and eating fruit like blueberries can totally help you loose weight! 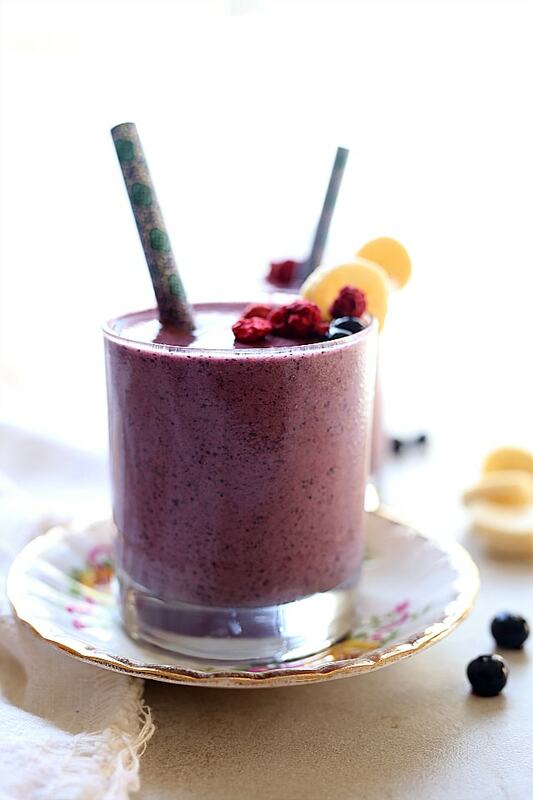 That means that this blueberry banana smoothie can help you loose weight! How do blueberries help you loose weight? The beautiful perennial flowering plant has so many antioxidants that are linked to reducing belly fat, diabetes and heart disease. See blueberries have a certain way that glucose is stored and processed in the body therefore it does not have the same effect of fat storage that white sugars and carbohydrates have on the body. I have been playing with new apps to make video tutorials. For my past videos I use my DSL Cannon 6D which seems overly complicated to edit videos simply because I have to sit still at a computer. Editing is done on a separate computer than my laptop that I type my blog posts. I was having to use USB drives to transfer everything everything and needs to change. My iPhone does an exceptionally well job. I know this because I made this blueberry smoothie three times and shot three different videos, all which are complete failures. Nothing less than the lighting was not good, I should have done different angles, etc, etc. But what I started thinking is that my time is more valuable than making a fourth blueberry banana smoothie just to shoot a video. What I perfected for this video post needs to be used for a carrot soup recipe I want to share soon:-) Not on a fifth smoothie because I have no ingredients left for another one. 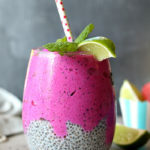 Really, I am pretty sure you all know how to make a delicious smoothie. 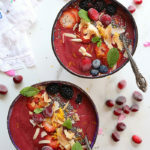 Just toss the ingredients into a blender or Vitamix, blend and enjoy! But what you might not know is the exact ratio used in an epic banana and blueberry smoothie. 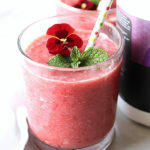 Smoothie recipes used to overwhelm me because I never knew how much frozen fruit to use, ice to make it thick enough or whether to use juice or milk in the recipe. When I first started making smoothies my poor Chase hated them. He still won’t eat my smoothies to this day. 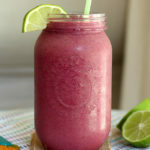 But since my trial and errors with the first kid are in the past my second child LOVES my smoothies! And that makes me so happy because they are always so nutrient dense and quick way to ensure your body is getting what it needs for energy. With each video I tried to do, Curren was stoked to eat all the props and every last drop of this satisfying smoothie! Getting at least 1/2 cups – 2 cups of blueberries or fruit per day is essential for optimal health. Here is the ratio of fruit for this smoothie which serves 2: 2 cups of blueberries and 1 banana! That is the perfect daily amount your body needs of potassium and antioxidant energy after a workout or in the morning! 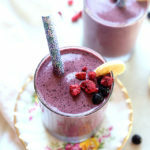 Blueberries have a natural cholesterol blocker so this blueberry banana smoothie is perfect for aiding in reducing cholesterol! Not only do blueberries bind to naturally produced cholesterol, protein has the same effect. Certain plant based proteins bind to cholesterol in the body which hide cholesterol’s negative effects. No joke ‘all, blueberry smoothies are my favorite especially packed with protein! 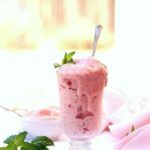 If you have just woken up, finished a workout, or need a mid afternoon pick-me up, this is just the right silky sweet treat your taste buds thank you for! Quick and simple healthy blueberry banana smoothie recipe! 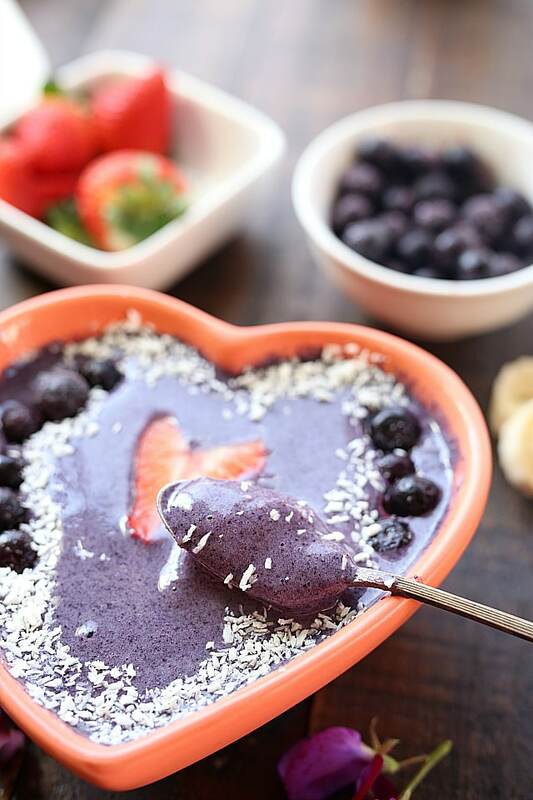 To make this gorgeous indigo colored blueberry smoothie add dairy-free milk to the blender with frozen blueberries, banana and two extra secret ingredients to give you the perfect balance of energy that will last for hours! In a blender add the blueberries, banana, almond milk, flax seed meal, protein powder and blend together until smooth. Pour into two cups.